A few weeks ago I had an article published on Careershifters.org and thought I would share it here on my blog. Some people have asked over the past year why I changed and how it has worked out, so here it is, warts and all. I trained as a chartered accountant. I spent five years as an auditor in a large corporate, then a further three years as a financial accountant in industry. This year, I’m exploring various roles in the food industry, something that I’ve dreamed about for a long time. I’m currently freelancing in the food tourism and hospitality industry and I’m loving it. I work for a food tour company, guiding culinary tours around my city as well as assisting the same company with the PR, social media and marketing side of things. I’m also working part time in commercial kitchens and learning the restaurant trade. I started a food blog a year ago and recently had my first article published in the online food magazine, The Taste.ie. Simply put, I’d been miserable in my job for years. Although I knew in my gut it was not for me, I continued trying to ‘make it work’. I tried a number of different industries within the finance world and it made no difference – I wasn’t enjoying it. My confidence was at an all-time low. I had no interest in progressing – I couldn’t bear the thought of being in a more senior role. The job was having an effect on my personal life, with tears being shed on a regular basis. I came home from work very unhappy most days. It used to keep me awake at night. It was like a vicious circle – I never felt good enough for the job, and at the same time I had no interest in trying to improve myself or learn the trade. It just wasn’t for me. In my spare time I used to listen to TED Talks and podcasts about finding happiness in your career – I could probably recite Steve Jobs’ Stanford University speech verbatim. There was no defining moment: I’d been threatening to leave for years but never actually took the plunge. I’d gone to see a career guidance counsellor in my first year as a trainee accountant and, much to my dismay, he told me I should stick with it. A decade later, when I turned 30, I thought, “If I don’t do this now, I’ll end up in a career I’m unhappy in until I’m 50”. I realised I had no major financial commitments, and after many years of reading inspiring stories on this website I decided to just go for it. I’m absolutely delighted and truly never look back. I love the variety and the flexibility. I meet incredible people every day who inspire me and keep me motivated. My job is rewarding and gives me a sense of purpose. I no longer spend my days watching as each hour slowly ticks by, I don’t long for Fridays, and I’m no longer filled with dread on a Sunday evening. Although it isn’t as financially rewarding at the moment, I know if I continue doing what I love I will find a niche. I was never going to be happy in my previous job, no matter what the financial benefits were. There isn’t a lot I miss, bar the pay cheque. The financial compensation in the finance industry far exceeds that of the food industry, so far anyway. But the positive in that is I have more respect for my things – I used to spend money without a second thought but I ‘window shop’ a lot more these days and when I buy something, I appreciate it a lot more. I certainly don’t miss the feeling of anxiety, stress, sleepless nights and worry about being in a job I didn’t like. I don’t miss the routine of a 9–5 or the rush-hour commute. Even working on Saturdays isn’t so bad because I love what I do. While I was still working in my old job, I decided it would be useful to get some experience of life in the industry. I wanted to meet people in the industry as a form of first-hand research, so I applied to be a volunteer at food festivals around Ireland. I signed up to do dish-washing, ticket-handling and so on. Once I had an opportunity to meet anyone willing to talk to me (food bloggers, writers, chefs, artisans, food producers, etc), I was open to doing anything. It was a lot of fun and it reinforced my desire to work with food. I also contacted cookery school owners and volunteered my time with them in order to get a feel for different businesses that might suit me. 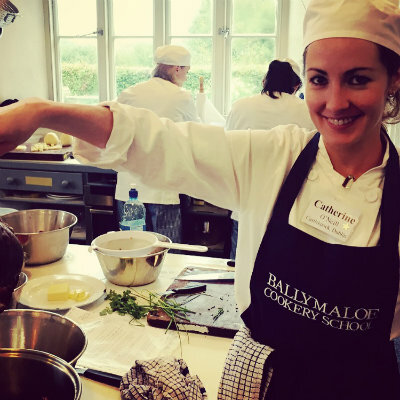 Furthermore, I researched many cookery courses in Ireland and abroad, and eventually signed up for the three-month, Ballymaloe cookery course (Co. Cork, Ireland). This course was important in helping me learn the nuts and bolts of the industry and giving me a solid foundation for going forward. It’s deemed one of the best in the world as you live on an organic farm throughout the course, learning about food from a ‘farm to fork’ perspective. It was fantastic and this post sums up my experience there. After all my research on the various courses, I applied to Ballymaloe only to find the course was fully booked. I was heartbroken. I should have had the foresight to put my name down earlier. However, rather luckily, there was a last-minute cancellation and I managed to get in. Ironically, given my former career, I didn’t handle my finances too well. I should have financially planned to get out but I was too busy having a good time and travelling when I could. I ended up having to take out a loan which I’m paying off now. When I moved to Cork to attend the cookery course, I took in a tenant too to ease the financial burden. The most difficult thing was actually making the decision to leave the security of my job behind. I had put so much into my old job – years of study, exams and commitment. It was difficult because I thought I was just throwing all that away. I came to terms with this by recognising the fact that actually everything from my years in the corporate world was valued experience that I would take with me to the next chapter. Once I accepted that, it made the decision a lot easier. As soon as I submitted my notice, I felt a huge wave of relief. In fact I was incredibly emotional, crying when I handed in my notice (I think because I’d finally taken the plunge), crying when I left for the course in Ballymaloe, and crying when the course was over. It was an overwhelming time in my life – all the tears releasing the tension that had built up over the past ten years. My fiancé (now husband) was extremely supportive. He encouraged me to go to culinary school, which was a hefty financial burden for us during the same year we were planning our wedding. It also meant I had to move out for three months – it was a live-in cookery school located about 250 km away from home. Ultimately, I couldn’t have done it without him. My parents and friends were also a fantastic support, listening to my endless tearful conversations. I was incredibly lucky to have so many people who listened and who continue to support me. Careershifters was a website I visited every day. I used to pore over the inspiring stories and wonder whether, someday, perhaps one of them could be me. It was so helpful to know I wasn’t alone. Also, I’d recommend speaking to those who’ll really listen to what you’re going through. Finally, the people already in the industry are invaluable resources – get out there, network and connect! I’ve learnt to follow my own gut, and not to listen to too many other voices along the way. I already knew where it was I wanted to go – it was more a case of having the courage to take the leap. I have learnt a bit about myself: that I enjoy writing blog posts, for example – something I didn’t know I was able to do. I don’t regret doing accountancy as it’s a qualification I can always fall back on. It’s given me a range of skills that I can take with me through life. Perhaps I will use them someday if I ever set up my own business. However, I’m sure there would have been no harm done had I pursued my options a year or so earlier. It sounds clichéd, but life is short. Follow your heart. You are far more likely to excel in a career you enjoy than in one you’re just coasting along in. Be true to yourself. Both you and your family will benefit if you’re happier within yourself. If finances are holding you back, look at all your options and start saving now. Can you take a part-time job to cover a college course or get some experience as an intern? Start to talk to people in the industry you’re interested in. I found everyone I contacted was extremely helpful and generous with both their time and advice. Ask yourself, what is the worst possible outcome if you change? If it doesn’t work out at least you will have tried and tested, rather than living a lifetime of wonder. This article was published by Careershifters in the below link. Previous Post Food Philosophies – The best diet for a sustainable planet?